Word on the street is you are passionate about eco-justice and you'll do just about anything to achieve it. First off, props for your commitment to activism! Second, we should state for the record that plants are cool. Please don't hurt us. The way we see it, there are two ways to fight for the environmental causes threatening our one home. These are moonshots, but first, one could read the news to keep abreast of all the pressing ecological matters, write a strongly-worded letter to their representatives, and finally vote with crossed fingers for the public official who represents you and your concerns best. That's option one. We know you're not exactly brimming with excitement to leave the health of all the trees and flowers and agriculture in the hands of some Wall Street boot-lickers, so we've devised for you a more direct approach. Option two: Use mind-controlling pheromones and toxic flora to persuade and poison your way to eco-justice! Yeah, not sure what it was, but we thought that might be more your style and speed. Again, please don't hurt us. 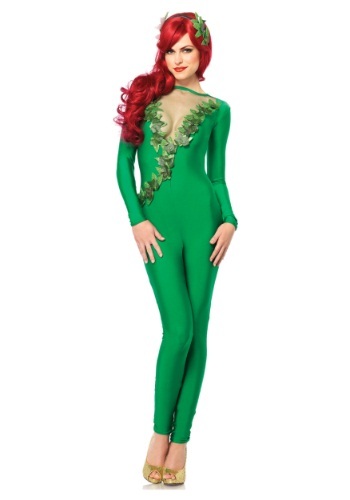 With this Ivy Vixen Adult costume, option two becomes a bit closer to a real possibility. Grab a luscious red wig to complete the image and you can flaunt your crimson locks to those pesky politicians or distract the more straightforward (and boring) superheroes from getting in your way at the next costume party. Dressed like this botanical babe, everyone will want to be wrapped in your vines. Note: mind-controlling pheromones, exotic plants, and potent toxins are, unfortunately, all sold separately.